The former 4 star prep has shown promise with his athleticism and rangy frame and ability to go up and get jump balls as well as give the defense different looks from Cal's potent receiving arsenal. The 5-8/175 Hawkins was a fall enrollee with most of his class but the speedy receiver hit the ground running, compiling a highlight reel of receptions in the handful of open practices, including a beautiful grab in the back of the end zone to wrap up the last public scrimmage. As a prep, Hawkins accounted for more than 2,000 total yards and 21 touchdowns for Buena Vista during his junior and senior seasons. 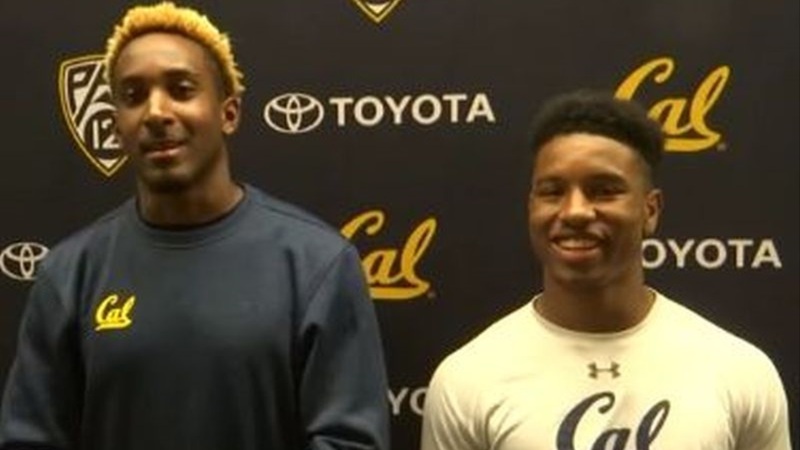 Hawkins had an inside man at Cal to help pave the way for him, with his older nephew Jaylinn spending his first two seasons as a Bear before Hawkins' arrival this fall, seemingly poised to earn the start in the Bears' opener if not significant playing time. "It's kind of crazy. I didn't see it coming at all," said Johnson, of his and Hawkins' longtime association continuing to the next level at Cal. "We've been playing together since we were young," added Hawkins. Since they've joined the program, both receivers have made nice strides in their games and have worked well with young receivers coach Nick Edwards. "Coach Edwards has done a great job developing us and teaching us techniques about how defenses play and we can only go up from here," said Johnson. "Just to touch on what Rico was saying, Coach Edwards has been doing a wonderful job, teaching us technique and the correct ways of being precise and just running routes and being a real receiver," added Hawkins.